Three young women soon to graduate from the Roger L. Putnam Vocational Technical Academy have each won a $1,000 Farris Mitchell Scholarship to help them get started in college. Briana Lee, Khialeny Peña and Fergie Perez have different career goals, but will all go to college in September with a gift to help pay for books or other expenses. Each young woman expressed gratitude for the scholarship granted yearly by the Springfield Housing Authority. 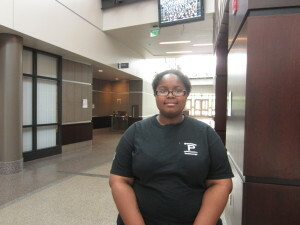 Briana Lee, 19, is a senior at Putnam and one of three recipients of the Springfield Housing Authority’s Farris Mitchell Scholarship. The total amount represents the largest gifts awarded since the scholarship was established 20 years ago to honor the legacy of a man who had a third-grade education, raised 10 children in public housing, and saw that they all completed high school. Five of the children of Farris and Julia Mitchell went on to complete college. Jimmie Mitchell is the eldest of the 10 children, and helps administer the scholarship as part of an SHA committee. He is the authority’s Youth Engagement Coordinator, and a retired counselor from Putnam, making this year’s crop of winners extra special to him. “This means so much to me, and to all of my family,” said Mitchell, whose father died in 1994, and whose mother will meet the young women at a June 21 meeting of the SHA Board of Commissioners. “We’ve been doing this for so long, and we’re all so happy that our dad’s memory is still alive and helping these wonderful young people,” he added. The Mitchells lived in Riverview Apartments, an SHA development in the Brightwood section of the city. Khialeny Peña is 17, also a senior at Putnam. She is planning a career in nursing. The family started the scholarship after Farris died, privately raising funds for awards each year. The SHA now funds it, and generally gives one or two $1,000 awards away each spring to a high school senior who lives in public housing or has a SHA-administered rental assistance voucher, and has been accepted to college. This year, three $1,000 scholarships were given, a first. SHA Executive Director William H. Abrashkin said he is happy to fund the program, which fits perfectly with the authority’s goal of fostering family literacy and independence. “On its twenty-first anniversary, the Farris Mitchell Scholarship Program of the Springfield Housing Authority has truly come of age. For the first time, the Board and staff of the SHA are delighted to announce that the program has been expanded to offer three separate scholarships to outstanding young people,” Abrashkin said. Fergie Perez is 18, a Putnam senior who will head to Westfield State University to study to be a high school mathematics teacher. Lee majors in auto mechanics at Putnam, and plans to study deaf education at, first at Holyoke Community College and later at a four-year college. She is one of 10 children, and lives with her mother Erica Lee and several siblings in an apartment in the Boston Road section of the city. 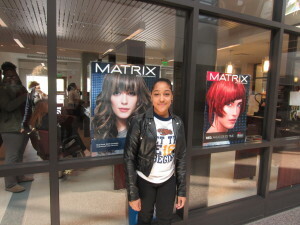 She is the first in her family to be going to college. Peña is an allied health major who plans to study nursing at the Elms College. She chose her career path three years ago after the death of her beloved grandfather, a long-time drug user. Peña is the youngest of four, and the first in her family to go to college. She lives in the North End with her mother, Joane Rivera, and two of her siblings. In addition to maintaining high honors, she works full-time as a certified nurse’s assistant. Putnam High School seniors Khialeny Peña, 17, Briana Lee, 19 and Fergie Perez, 18, with SHA Youth Engagement Coordinator Jimmie Mitchell. The three each won a $1,000 scholarship in memory of Mitchell’s father, the late Farris Mitchell, to help them pay for college in the fall. 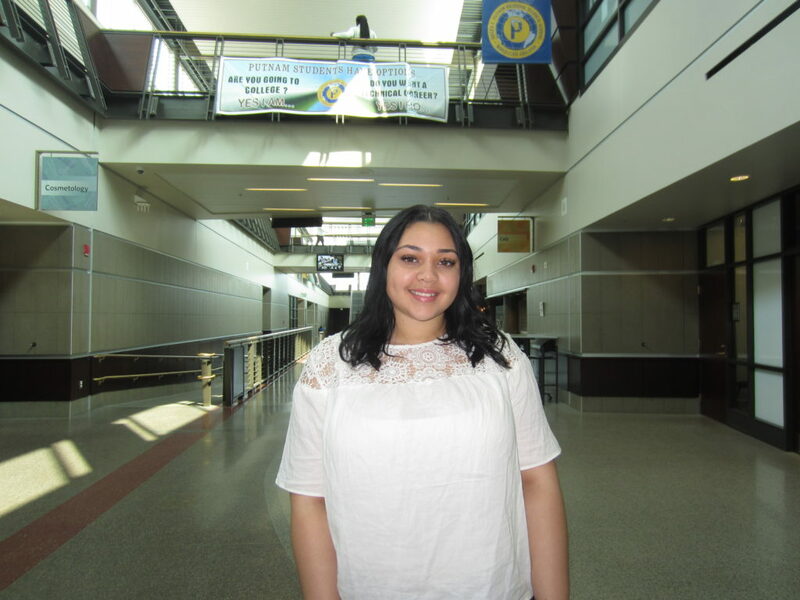 Perez is an early childhood major at Putnam, and she will head off to Westfield State University in the fall to study to be a high school mathematics teacher. The high honors student said being good with numbers “runs in my family” and she looks forward to helping others understand sums, formulas and other mathematical concepts. Like Lee and Peña, she is most grateful for the help that the Mitchell scholarship will bring.